A food allergy is an abnormal immune response to food. The signs and symptoms may range from mild to severe. 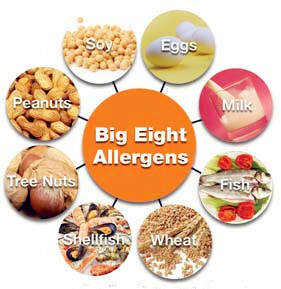 A food allergy may affect the skin, the gastrointestinal tract, or the respiratory or cardiovascular systems. Many types of foods can be allergens, but certain foods are much more likely than others to trigger an allergic reaction. Food allergens testing is therefore carried out to identify and quantify the presence of allergens in food. Food allergen labeling is mandatory according to EU, Canadian, Japanese and Australian / New Zealand regulations, all of which follow Codex Alimentarius recommendations. AES Laboratories offers screening and quantitative food allergens testing to detect almond, β-Lactoglobulin (BLG), casein, cashew, crustacea, egg, gliadin/gluten, hazelnut,lupine, mustard, peanut, pecan, pistachio, sesame, soy, total milk, and walnut residues. AES Labs’ food allergen tests can detect the target allergen in ingredients, liquids, and finished foods.